A fabulous choice was made by our good friend Pippa this month. 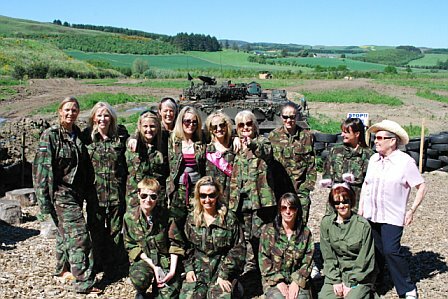 She decided to hold her hen party at Tank Driving Scotland! 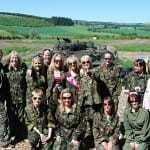 The 15 girls descended onto our site on the 31st May dropped off in a pink Limo to begin the action. Arriving in very pink attire (with some rather interesting head bands! 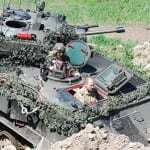 ), the girls made a quick change into army gear and got camouflaged up Tank Driving Scotland style. 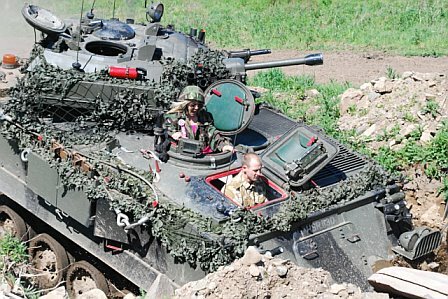 After negotiating the course in the Tank and Mini Monster Truck – the ladies had to negotiate their way to the Digger driving through our army trenches! (Lots of loud bangs involved, which resulted in LOTS of screaming!). Pippa was a dab hand at operating the digger bucket and this was her favourite activity (am I feeling a change of job coming on?!!). 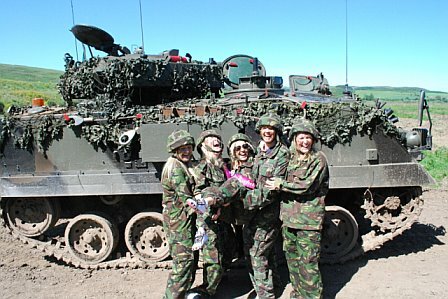 Pippa’s hen party was enjoyed by everyone, from ages of young adult to her granny! We all took part and had a fabulous time. 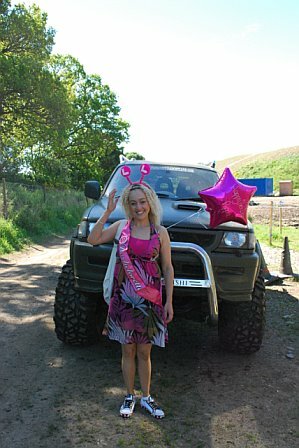 When the limo arrived for the pick up, it was just no comparison to the other vehicles on the day… Pippa’s hen party went on for a wonderful BBQ in the garden with a very specially ‘Butler’ in an apron. It was unfortunate he had to cook the barbeque (burning hazard!). I believe the evening finished with some terrible renditions of ‘I will survive’ on the karaoke. 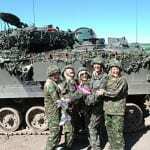 We are so pleased to have provided a fantastic hen party for Pippa – and she promises that if this marriage doesn’t work out, she’ll be back for her next hen!